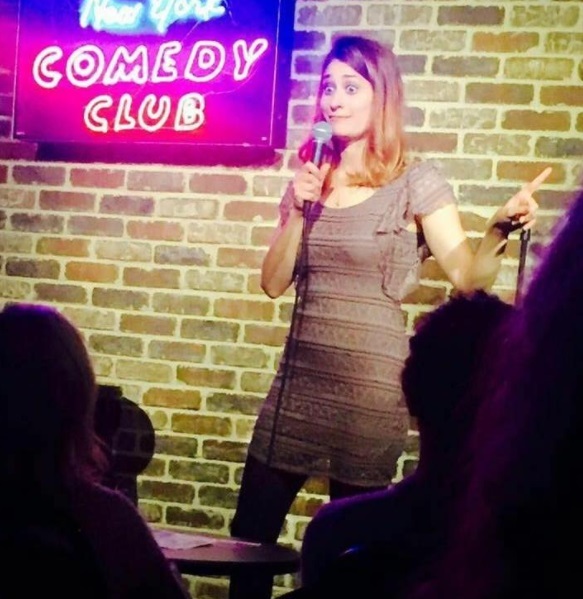 Kate Wolff is a stand-up comedian and healer who you've seen on Tru Tv's, "World's Dumbest", Elite Daily, Parents.com, FOX's Red Eye, and NickMom's Night Out on Nickelodeon. She performs frequently at clubs throughout Manhattan, and is a regular at New York Comedy Club, and Stand Up New York. She has a popular podcast "Invasion of Privacy" that combines her edgy humor with her spiritual beliefs. She has performed in the New York Comedy Festival, Laughing Skull Festival, and Boston Comedy Festival. Kate is currently enrolled in a 4 year Non-Dual Kabbalistic Healing School called A Society of Souls from which she graduates this June 2018. I am pretty good at being honest, and wearing my heart on my sleeve even when it's super uncomfortable to do so. I'm also good at finding light in almost any dark situation. When I show myself compassion, and remind myself that no one is perfect and it's okay to have flaws. It's the ability to touch and express those dark places that makes us incredible artists and co-creators. I hope the continue to dig deep within myself and heal so that I can be more and more of my truest authentic self. I want to keep creating artwork whether it's through comedy, music, poetry, or visual art that reflects my true feelings. I hope to inspire people to speak their truth as well, and to create art that is both triggering yet healing. I also want to keep being the best mother I can be to my beautiful 11 year old son, and show him it's okay to fall as long as you keep getting back up. I also want to speak up for the planet, and every being that resides on it because so many people and animals are in deep suffering. I hope somehow we can all heal these deep wounds together to create a more enlightened collective. I'd have to say my son, my career, and myself. I'm so proud of how tuned in and well spoken my son is. I also am proud of the fact that I left teaching 6 years ago to pursue comedy full time. It's been a long journey, but I manage to keep going even when I have bouts of anxiety and depression. I always know I will not only get through the darkest moments, but will do so an grow from each one. After my divorce I didn't know where to go next, and went through a really dark time. I just put one foot in front of the other, and never gave up on myself. About two-three years later I got into stand up comedy, and things started to really turn around. Being patient with the process of life, and having faith that the universe truly has my back. To try and be as present as I can in each and every moment, so I don't miss the small miracles of life. I try to be grateful for the things I can easily take for granted like my health, my son, and my home. My son is my role model, because he always manages to find the middle ground in every situation and doesn't usually take sides. Even when I get triggered he reminds me it's okay, and that we are all trying our best. He's the one who truly woke me up spiritually. When I had him I was agnostic, but now I am so invested in the healing journey. I love visiting Maine, and being around lakes, and trees. I also love finding crystals and digging for them in remote places in the woods. Tea Tree Oil is amazing and is helpful with so many ailments. I also love Dr. Schmidts natural deodorant because it's the only natural one that actually works. -Getting more into creating music, and expanding within that art form. -Continuing my education with A Society of Souls and going deeper and deeper with my exploration of the unlimited nature of consciousness. Pushing the boundaries in comedy, and continuing to build a bridge between the spiritual and comedy communities. -Learning every day how to be more and more open hearted.